Super Savings Item! Save 37% on the Alvin MT37-OR Ice Tubes Orange Storage & Transport Tube 2 3/4 inches I.D. x 37 inches by Alvin at Designers Artists. MPN: MT37-OR. Hurry! Limited time offer. Offer valid only while supplies last. These unique transparent PVC mailing and storage tubes are designed for anything that can be rolled, including charts, maps, blueprints, and posters. 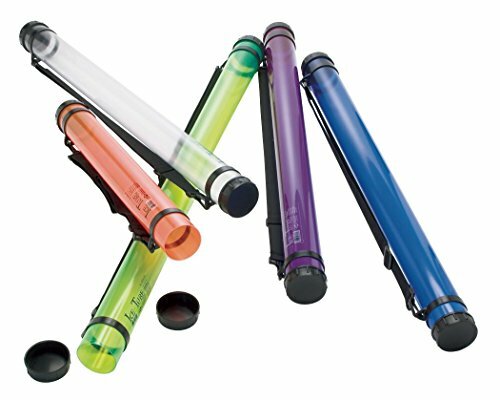 These unique transparent PVC mailing and storage tubes are designed for anything that can be rolled, including charts, maps, blueprints, and posters. One end cap is sealed closed and the other removable. Tubes are UV-protective, moisture proof, and have removable, adjustable shoulder straps. Shrink wrapped. View More In Art & Poster Tubes. Drawing Storage Plastic Tube with a Lace. Color: Violet - Extendable Length 27" to 43" / D 3.5"
DSM Brand - Telescoping ART Tube. Documents Blueprints Artwork Hard Plastic Expandable Carrying Case. 25-40"